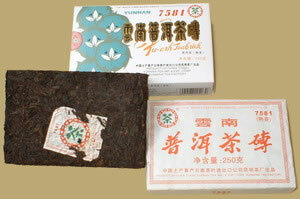 7581 Pu-erh Brick is one of the most famous tea products from CNNP, it is a classic recipe and first produced in Kunming tea factory in 1975, known by its rich taste. Since 2006, the factory put anti-counterfeiting label on box, processing this tea according traditional processing method of that day. The tea is good to drink now, but the tea could easily go for more years of storage which will only increase its quality.